Premier League giants Manchester United will host Dutch side PSV Eindhoven in the fifth group game of the Champions League tonight at Old Trafford. Manchester United have several players on the sidelines, some could be returning tonight. Wayne Rooney, Anthony Martial and Marouane Fellaini all are back to full fitness and are ready to start this game. Phil Jones and Ander Herrera are likely to watch the game from the stands as they are out through an injury. Bastian Schweinsteiger is doubtful for this game as he missed the training recently. Memphis Depay could be back after his impressive displays in the Premier League game against Watford last weekend. Jetro Willems remains out through knee injury. He has not featured this season. Maxime Lestienne is absent since last month, he has been an important player for them but the Dutch side will have to manage without him. Menno Koch will also miss this game due to an injury. Santiago Arias is one booking away from a suspension. Manchester United are unbeaten in their last three Champions League games. PSV have won two of their last three games against the Red Devils. A win for United tonight could cement their spot in the Champions League knockout stage. 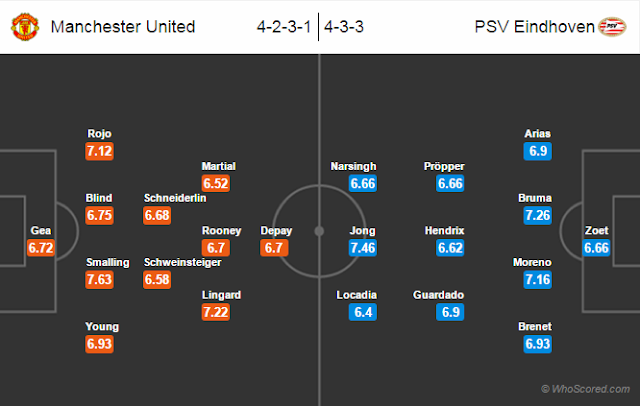 Manchester United 1 – 1 PSV Eindhoven, Wayne Rooney to score for the home side.